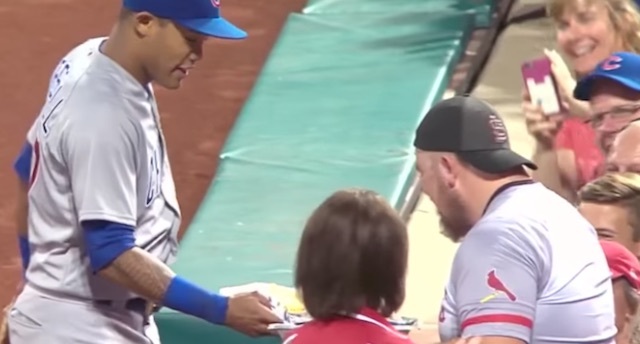 It may have been a cheesy gesture, but Addison Russell was determined to make it up to a front row Cardinals fan during Monday night’s game. 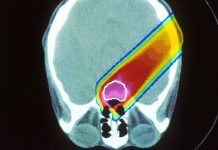 21-year-old Andrew Gudermuth and his girlfriend Hannah Lucas had been enjoying a tray of nachos when the Chicago Cubs shortstop went diving for a foul ball. Unfortunately, Russell also plunged headfirst into the stands, right into the laps of Andrew and Hanna, upending the couples’ lunch. Not only did workers at Busch Stadium in St. Louis, Missouri immediately replace Gudermuth and Lucas’s cheese-stained shirts with fresh apparel, but Russell also hand-delivered a fresh tray of nachos to the couple in between two of the innings. Pleasantly surprised by the gesture, Gudermuth and Lucas were featured on the video board with their celebrity snack. Additionally, Gudermuth got to take a selfie with the shortstop and post it to his Twitter account, which he has now branded as “Nacho Man”. While Gudermuth says he is still a die-hard Cardinals fan, he admits he has newfound respect for Russell as na-cho average baseball star.